Attractions like Adventure World Perth Australia and Perth Zoo make great kid-friendly stops. Step out of Perth to go to Fremantle and see Fremantle Prison, which is approximately 32 minutes away. 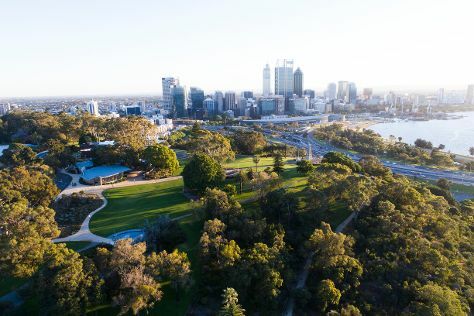 There's much more to do: walk around Kings Park & Botanic Garden, take in the views from Elizabeth Quay, explore the activities along Swan River, and appreciate the history behind Kings Park War Memorial. To see maps, more things to do, and tourist information, use the Perth itinerary maker website . In February, daytime highs in Perth are 38°C, while nighttime lows are 20°C. Cap off your sightseeing on the 17th (Sun) early enough to travel back home. Exmouth is a town on the tip of the North West Cape in Western Australia. Your list of things to see and do now includes Mandu Mandu Gorge, Yardie Creek, Scuba & Snorkeling, and other attractions. On the 18th (Mon), contemplate the waterfront views at Yardie Creek, identify plant and animal life at Wildlife Areas, explore the wealth of natural beauty at Mandu Mandu Gorge, then meet some fierce fish with a shark diving experience, and finally identify plant and animal life at Jurabi Turtle Centre. On your second day here, see the vivid underwater world at Ningaloo Reef, kick back and relax at Turquoise Bay, and then take in the exciting artwork at The Ningaloo Gallery. To see photos, reviews, more things to do, and tourist information, use the Exmouth trip planner . You can fly from Perth to Exmouth in 5.5 hours. Other options are to do a combination of flight and car; or drive. Plan for somewhat warmer temperatures traveling from Perth in February, with highs in Exmouth at 44°C and lows at 28°C. On the 20th (Wed), wrap the sightseeing up by early afternoon so you can travel back home.